When you visit Japan you can’t not go to one of the bizarre ‘animal-attractions’ they have there. And with bizarre I mean things like a fox village, capybara hot springs or a cat island. 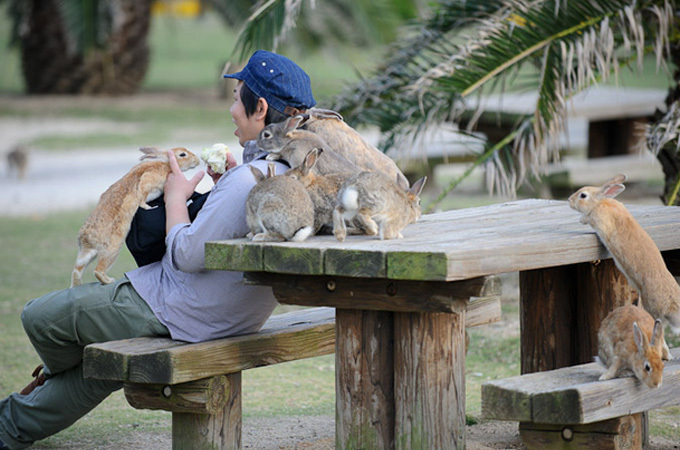 However, one of the most famous ‘animal-attractions’ is bunny island, also called Rabbit Island, situated in the Hiroshima prefecture. Why the name? Because Rabbit island is completely overrun with cute bunnies. There are a couple of hundred fluffies on the small (about 6 km if you follow the hiking trail) island, and they will come running to you if you bring some food with you. Check the video below of a guy who’s hugging at least thirty rabbits at the same time. How did the bunnies get there? How cool is that?! But eh… how did all those bunnies end up there? There are actually two theories. 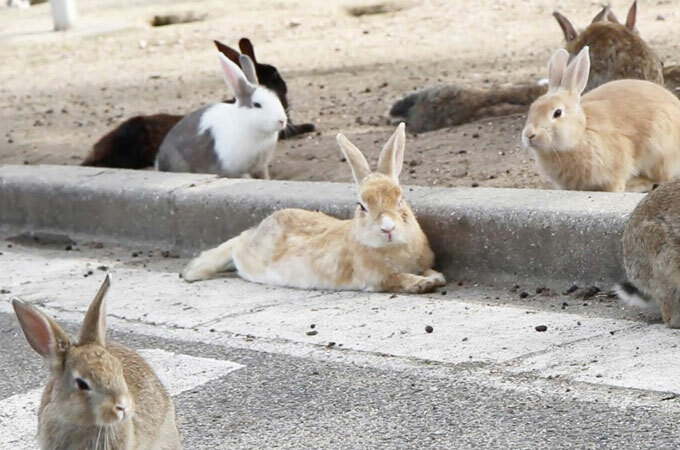 One is that a bunch of elementary school kids brought eight bunnies with them on a field trip and set them free. Since that happened in 1971 they have been multiplying like crazy, creating bunny island. The other theory is a lot darker and less cute. This theory goes like this: the reason for the big bunny-population is that during the WWII the island was used to create poison gas. The rabbits were used to test the effects of the poison gas and when the war ended they were freed by the workers. However, this story has always been denied by everyone, including the director of the museum on the island. The island however was in fact used to produce chemicals. During the war it was even wiped off the maps and locals were forbidden to talk about it. While working at the factory many workers (also children!) died during the manufacturing of the gas, mostly due to poor equipment. 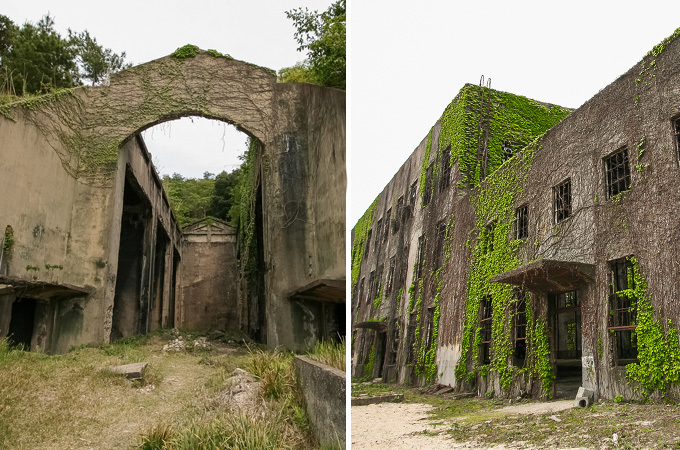 Some even believe the island is not completely safe since the buildings and basements have not been cleaned thoroughly, maybe even leaving places with poison gas remaining. However, you’re not allowed to go inside the old buildings on the island, so if you’re a good tourist and listen to those warnings you should be fine. You can reach the island Ōkunoshima by ferry from Tadanoumi en Ōmishima. The ferry terminal is really close to the station, you can walk it in 5-10 minutes (depending on how many pictures you want to take along the way 😉 ). Here you can find the ferry schedule (and train times). A one-way ticket from Tadanoumi to Okunoshima is about 300 yen (kids 150 yen). The ferry ride only takes about 12 mins, so make sure you have your camera ready for some great shots of the scenery around you. Tadanoumi station – Tadanoumi port, it is a 5-10 minute walk. On Rabbit Island a free shuttle bus will bring you to the only hotel on the small island: Kyukamura. If you have a lot of luggage you can store it there. There are bikes you can rent, but seriously guys, walk. The island has a hiking trail of about 6 km (round-trip), so you’ll manage. And if you want to feed the bunnies it will only be in the way. You can buy rabbit food in the restaurant of the hotel, and I heard it is definitely worth to eat there yourself. Keep in mind though that the restaurant is only open during the day, you can’t eat diner there (only for guests). You can also take food for the bunnies with you to the island, they especially like carrots and cabbage. Besides the rabbits, you can aso check out the Visitor Center. It’s free to visit and open from 9:00 to 16:00 (closed on Thu and Wed, also Jan-Feb). In the museum nearby you can learn more about the history of the island. Also, most definitely visit the small lighthouse and observation deck on the island. It takes a little effort, but from there you’ll have an amazing view on the beautiful ocean and main land. And if you’re tired of the bunnies, mysterious decayed buildings and breathtaking sceneries (me being sarcastic here) you can also relax on the beach or in the pool (open during summer). Although the island is small, you can stay the night. The Kyukamura hotel is clean and functional as a few visitors said. But hey, if you can get a spacious room with amazing few on the inland sea and great food (both Japanese and Western) what more do you want? During summer you can also stay on the campsite, near the beach and pool. Great to visit with kids! If you would like to stay at the hotel you can visit their website: qkamura. Try to come during the week, so you have all the rabbits for yourself. The best rabbit spots are the visitor center, hotel, observation platform, ferry terminals and the little shrine. If you want to visit more places during your day-trip, you can visit Onomichi ( has lots of temples) and Fukuyama (has a beautiful castle).